The ONLY Winter Park Bee removal service featuring 2 University of Florida Graduate Entomologists...Go Gators!!!! Did you know that not all bee removal firms really know bees and other stinging insects? It's true, most pest control company technicians or beekeepers don't have the knowledge to properly locate, treat and remove a bee infestation.The All Florida Bee Removal.com team members are the recognized experts in stinging insect control in Florida. Our team consists of University of Florida graduate entomologists, state certified pest control operators & registered beekeepers. This is a cool pic of a recent Winter Park Bee Removal we did. 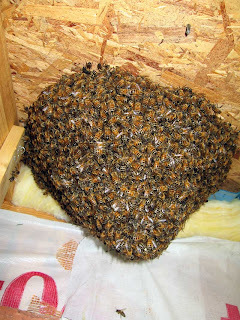 A swarm had recently landed in the soffit of the house, and as you can see, they are packed tightly together and building comb quickly. We were able to perform a live honey bee removal in this instance, as the colony was newly established, small, relatively gentle and we had decent setback and shrubbery, affording the neighbors some protection. In Winter Park, we are starting to see African Honey Bees, aka Killer Bees moving in from the East, so we think it's important to proceed cautiously when faced with a honey bee infestation. These bees were are starting to see in Winter Park, are becoming more defensive, and pose quite a liability risk to property owners and managers. When considering structural bee removal, please consider only hiring a professional, meaning one who maintains a Florida Pest Control Business License, as a minimum, as if the worst happens, and a sting event occurs, you're assets will be much more protected, than if an unlicensed provider was hired. I consider a honey bee swarm to be a "wonder of the world", and if you've ever had the pleasure to be within this natural phenomenon, you know what I mean. 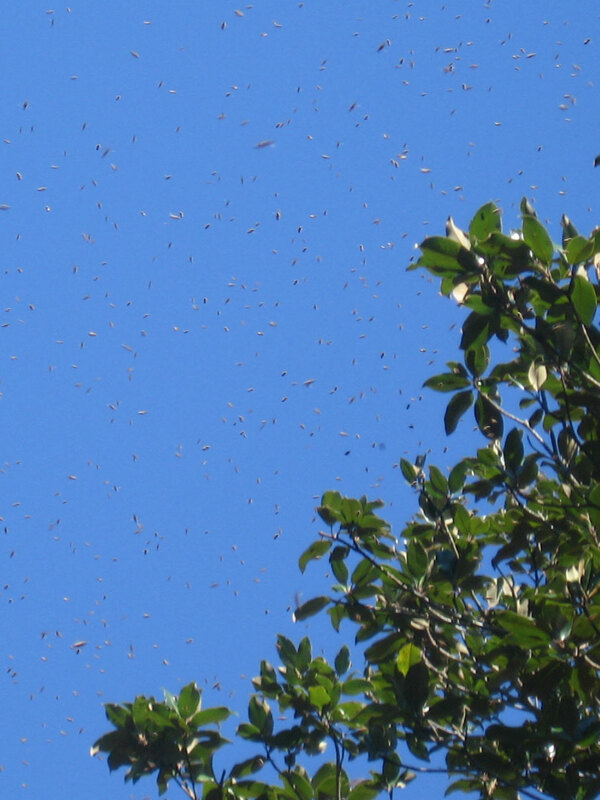 Tens of thousands bees, seemingly confused and flying randomly, darkening the sky with their bodies... I'm sure this can cause fear amongst some, but this is social order and group decision making at it's finest. 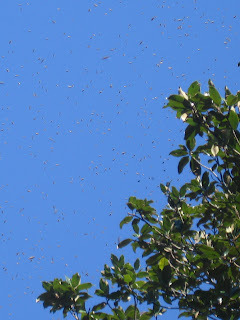 This photo is of such an event, an Orlando bee swarm, occurring a couple days ago in late August. Traditionally, we would not expect such late swarms, as European honey bees typically swarm in early spring as colony populations increase rapidly. But lo and behold.. African honey bees swarm nearly all year long, and since they have been increasing in numbers in the Orlando area over the past few years, we are seeing many, many more swarming events occurring this time of year. And, more of these swarms are stinging clients, children and pets, so please don't attempt to treat or remove these. Call us at Toll Free: 1-855-930-BEES (2337) or email us at Help, we need a bee swarm removal!!! for quick, competent and reasonably priced bee removal services. July 7, 2010, Orlando, Florida: Central Florida's CF13 News & WESH2 cover our removal of a very large honey bee colony located in the wall of a downtown Orlando Church. We enjoyed meeting and helping Mr. McGee. Call one of our experts at 1-855-930-BEES (2337) for expert Honey Bee and Killer Bee treatment and removal. Feb 6, 2009, Orlando, FL: We respond to a plea from the owner of Randall Made Knives near Orange Blossom Trail & Holden Ave. He has 2 very large aerial nests located 25 feet up in Oak trees on his property and he's concerned that the very cold weather will injure the bees. Our entomologist, Richard Martyniak & Winter Park Honey owner Scott Shurman perform the 2 intense live removals amidst an audience of local media. May 29, 2010, Tampa, Florida: ALLFloridaBeeRemoval.com responds to a Tampa Bee incident involving multiple victims, including Hillsborough County Paramedics! May 21, 2009, Tampa, Florida:ALLFloridaBeeRemoval.com's Entomologist Jonathan Simkins is interviewed by Tampa Bay's Connect 10 about a giant yellow jacket nest located in Pasco County. Yellowjackets are a specialty of Jonathan's and he loves to help folks out with treatments of these beneficial but very ornery stinging insects. See the story here. Call one of our experts at 1-855-930-BEES (2337) for expert yellowjacket tretment and removal. April 1 , 2009: All Florida Bee Removal team member, Entomologist Jonathan Simkins heard a news story about one of his long time and valued customers, restauranteur Alberto Morillo of Algusto Mexican restuarant needing help to keep his doors open. Jon and his family helped Alberto Remember, we are Florida natives & citizens, operating Florida businesses, helping Florida's people get through these tough times. MARCH 19, 2008: This Sanford Bee Removal customer was told by the Local hardware store to use cans of Wasp Freeze on a swarm of bees that had moved in to her wall, right behind her electric meter. Please O' Please NEVER EVER use cans of insecticide on Bees ! You will incite thousands of honey bees to fly around the immediate area and maybe around your neighbors houses up and down your street. And then when you do call us to do the job correctly, it takes longer to control the little girls, which means a more expensive visit. Plus, we absolutely cannot attempt a live removal ( applicable only in northern Non africanized regions of the state ). Story and more pictures to follow. Feb 18, 2008: Have some insects that you need Identified? Or just some cool pics of Insects that you want everybody to see? Send 'em in and our entomologists will be happy to ID them for you! These are Sarasota paper wasps (Polistes)..